Meridian celebrates 40th anniversary with £60k limited edition hi-fi system | What Hi-Fi? 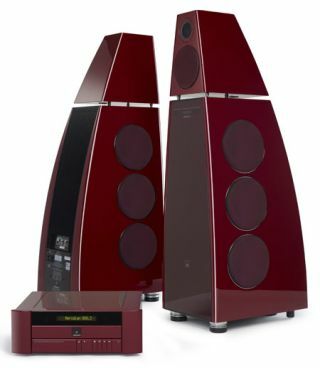 Meridian is marking its 40th anniversary with this limited edition music system, comprising an enhanced pair of the company's flagship DSP8000 speakers and 808 Signature Reference CD player. Both products were developed by the firm's founders Bob Stuart and Allen Boothroyd. Only 40 numbered editions will be produced worldwide, and each one will be signed by Bob and Allen and will come with an engraved plate showing its number in the series. Aesthetically, the Anniversary System is available in an exclusive 'Ruby' finish, and includes co-ordinated glass inset panels, speaker grilles and tweeter surround. Even the drivers are treated with a new, polished bezel. Each system will be supplied with a book illustrating the history of Meridian's Digital Signal Processing (DSP) speakers. Anyone who buys the Meridian Anniversary system will be offered a Meridian engineer to fine-tune the system in their home once it's been installed. All you need is £60,000 to pay for it.